I’ve known about Tim Howard for several years. I’ve followed his career both in the United States and overseas. He’s always been a great role model and an excellent soccer player. It was exciting for me to see he would be returning as the leader of the United States Soccer Team because he is one of the best goalies in the world. On Thursday, he proved that again. What’s really funny is that people around the world have known about his greatness for some time……but for us in the United States who are not big soccer fans, we have just figured it out. Tim’s story is an excellent reminder about what makes America great. We love the underdog story. We love to find the best in people even when they are not on top. I love seeing that Tim has become a household name across America even though we lost the soccer game to Belgium. That’s kind of neat. And on top of all of his success……oh, by the way, he has Tourette Syndrome! Tim Howard grew up with Tourette’s in a similar way that I did. We both were diagnosed at a young age. We both had good support systems in place. We both made the best out of the situations we were put in. We both found success in something and showed others our true strengths and talents. We both have become role models for thousands of kids and adults who are living with Tourette Syndrome every day. It is exciting to see so many kids with Tourette Syndrome stand up and be proud to have Tourette’s for just a moment. 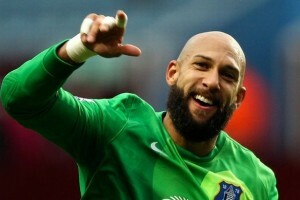 In some kind of weird way, it is cool to have Tourette’s right now, because Tim Howard, our great goalie has it too. And even though this moment for most people will only be short lived, the power that will come from this one moment will last a lifetime. We will see kids with Tourette’s have more self-confidence, persevere through tough times, and feel at ease to talk about their Tourette’s to others because they now know that others are aware of Tim Howard and Tourette Syndrome. I know life just became easier for a lot of people with Tourette Syndrome because of Tim’s success. For that, I salute Tim Howard for being the great person and role model that he has always been. You are currently browsing the archives for the tourette category.